Posted on June 3, 2016 at 1:36 pm. Shanghai Disney is going to be truly spectacular, but will it have an adverse affect on Macau’s many casinos? 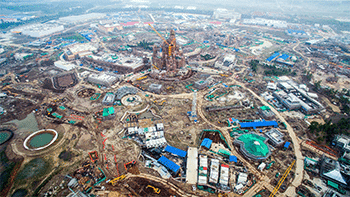 Shanghai Disney is going to be spectacular – this goes without saying. But why would it impact Macau casinos ability to get out of the current hole and make more money? A Morgan Stanley poll of 1,000 Chinese gamblers indicates 30% of them are less likely to visit a Macau casino after June 16, when Shanghai Disney opens. China has a young gambling demographic, with most of them aged between 21-49, with the iconic Disneyland largely targeting the same market, with many having kids, it looms as a battle for Macau. The news wasn’t all bad for the Chinese casino industry, with 26% of respondents saying they intend to gamble more in Macau next year because they want to visit Wynn Palace. Grosvenor Casinos gets a big tick for ingenuity. Owned by the Rank Group, Grosvenor has opened a casino in the back of an iconic London black cab as a publicity stunt for their land-based and online gambling operations. Grosvenor was taking requests via Twitter for rides in the decked out taxi, with it either taking passengers to a Grosvenor Casino of their choice, or a lift to anywhere else in the city in exchange for a donation to Carer’s Trust, a charity the casino group backs. Inside the cab, passengers get the low down on the nuances of car casino games, while they can also get a drink of their choice and watch sporting events live via two TVs. The promotion is aimed at lifting awareness of Grosvenor’s sports betting operation, with the taxi expected to take rides for around three weeks at places outside of London, before returning to its permanent home. Crown Resorts can breath easier, although patrons in their Macau investment might not, with fears over a draconic smoking ban eased by regulators. It had been floated gamblers would have to leave the casino premises before they would be allowed to light up, but after six months of negotiations casinos in Macau will be allowed to have dedicated smoking rooms. The casinos will be forced to meet a certain standard of ventilation, but the announcement is a major win, after worried operators expected a downturn if patrons couldn’t smoke close to their chosen game. Is Australia on track to become a full endorser of digital currency bitcoin? Soon we will be able to buy bitcoin with cash at 1200 newsagents across the country. A partnership between retail network Blueshyft and Australian Bitcoin exchange, Bitcoin.com.au, is set to make it much easier for antipodeans to purchase the digital currency. General Manager of Bitcoin.com.au Rupert Hackett says the joint venture should help promote trust in the digital currency, which has suffered its fair share of bad publicity. “It’s hard to trust the current Bitcoin exchanges because the process is very vague to the consumer,” he told Mashable Australia. Newsagents will be fitted out with an iPad which will allow customers to make their bitcoin transaction, with the two companies expected to make about a 4% commission on sales. Bitcoin has slowly become a popular deposit method at gambling sites, with more and more casinos and sports betting sites embracing it in recent times. If you’re looking for a safe online casino site that accepts players from United States, we recommend Raging Bull Casino which offers a large selection of instant-play casino games available for free play in practice mode or for real money bets.